2009 was a busy year for b+f. While no business is recession-proof we were still able to grow and work with some amazing new clients and people. The advertising world is changing rapidly especially on the digital side. Here are a few of our predictions of what’s on the way out and what’s on the way in – 2010! 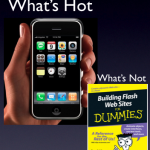 Flash websites – Yeah, they can look great, unless you’re looking at one on a handheld. Flash doesn’t load on many of these ubiquitous devices and that can be a real problem considering how many people are getting their info on blackberries and iphones. 173.6 million smartphone â€˜units’ were sold in 2008, and sales rose over 11% in 2009. The lies they’re telling you about print. – In our neck of the woods Hamptons Magazine had its best year ever, and not everyone on the beach is reading their blackberry. 92% of American adults and 75% of American teenagers read magazines. And those readers don’t fast forward through, click to minimize, or pay to avoid advertisements in print. Automated phone calls from credit cards companies – Politicians and live folks from India, Pakistan and Thailand. TAKE US OFF YOUR LISTS! Our website – cringe, cringe ~ a new one’s coming (and the check’s in the mail). The “Hi, I’m a Mac” ads – We loved them years ago when they launched, but they’re getting stale. Social Media – Facebook, Twitter, Linkedin, etc. Social Media is hardly new, but if you and your company aren’t using them, your news and your relevance are going to grow old fast. Twitter was the biggest retail tool on Black Friday. Mobile phone apps – not totally new but the hottest way to reach your audience. They’ll be big in 2010. Stand up Paddling (SUP) – Which is why Paddlers for Humanity and Paddle Diva are so hot. Our new clients – Trunzo Building, Old World Moulding & Millwork, Coral House, County Graphics, Landscape Details, and a handful more who can’t be named here but will be in 2010. The Allegria – the new hot luxury beachfront hotel in Long Beach. The next best thing to being at Shutters in Santa Monica (or better yet, right here in Montauk). HTML5 – The new HTML (web language) that will be formatted and used to deliver text, images, multimedia, web apps, search forms, and anything else you see in your browser. Some think only web developers really need to know this – but it’s a major revision to how the web is put together. Not every web site will use it, but those that do will have better support across modern desktop and mobile browsers (that is, everything except Internet Explorer). Another reason we love our Macs! Amazon’s new ad for Kindle – Makes us want to buy one. Here’s wishing you a Happy Hanukkah, Merry Christmas, Killer Kwanza and healthy, prosperous and FUN 2010!